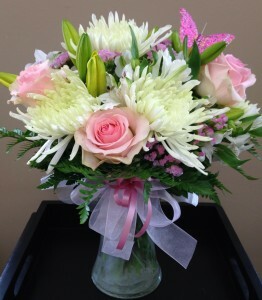 Let our designers arrange a Valentines Day mixed bouquet that includes the traditional holiday flower...the rose! If you have had a sweetheart for years or just met a new sweetheart, then this is the perfect gift to show them how much you care! 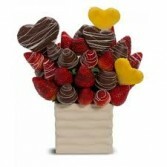 Everyone loves to share chocolate covered strawberries, along with sweet pineapple hearts. 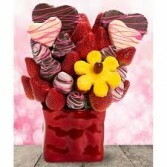 This bouquet is bursting with lovely succulent strawberries combined with pineapple hearts! Best of all! Lots of chocolate! You will earn lots of brownie points! Or, should we say chocolate strawberry points? "Bud" The Bear will help you bring a big smile to your Valentine. 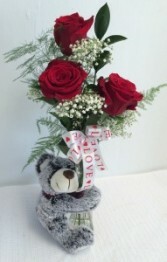 Three red roses with fluffy baby's breath held by this cuddly bear will make her feel warm and fuzzy too!